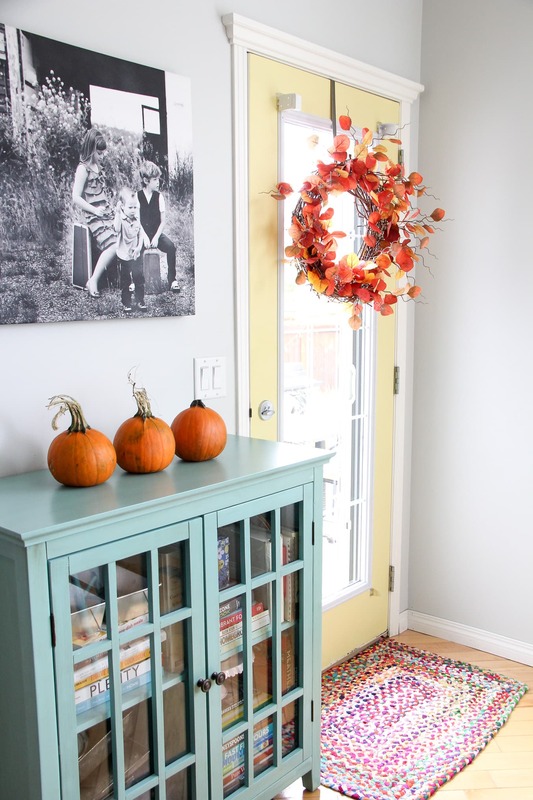 Welcome to my Bright and Cheery Fall Home Tour! 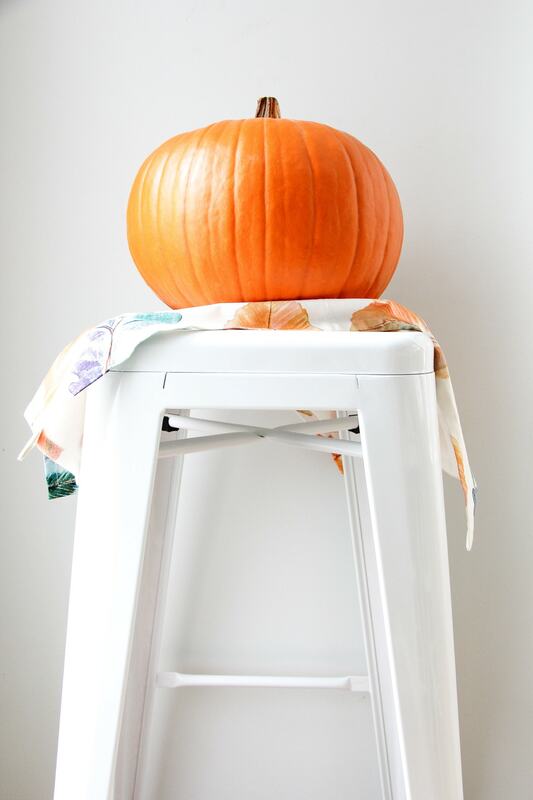 Find some inspiration to decorate your home for the fall season! 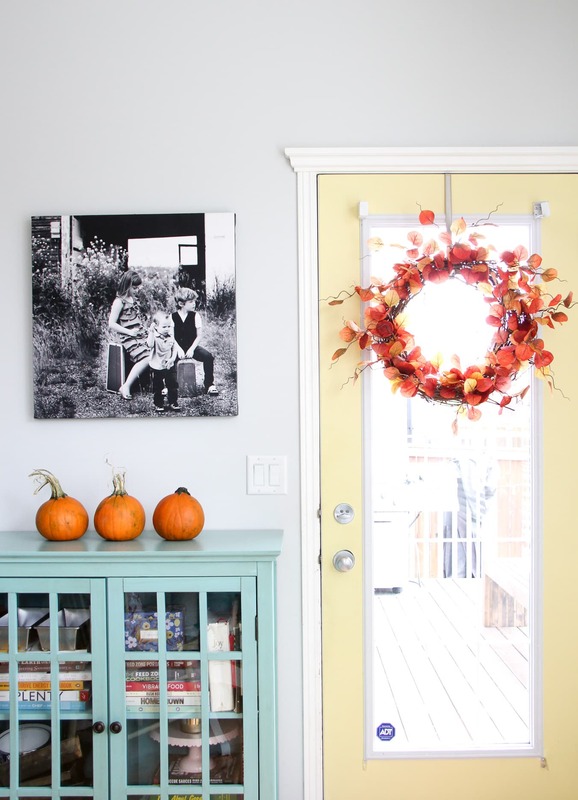 My home tour is 1 of 24 Canadian Fall Home Tours hosted by Christina of The DIY Mommy and Shannon of AKA Design! 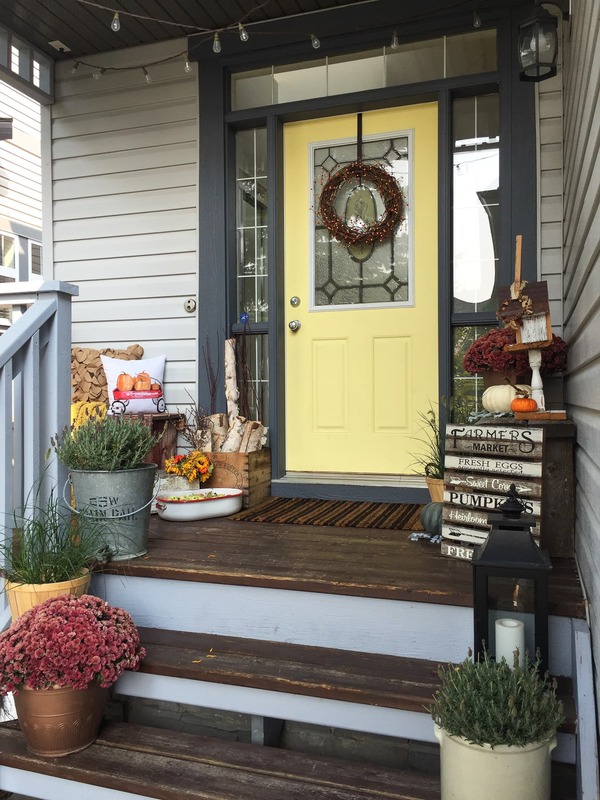 I hope you can take a moment to visit all of these beautiful and cozy fall homes and get inspired! You can find all the links at the bottom of this post. Today is my day to share, and I’m so excited to share my fall home with you! 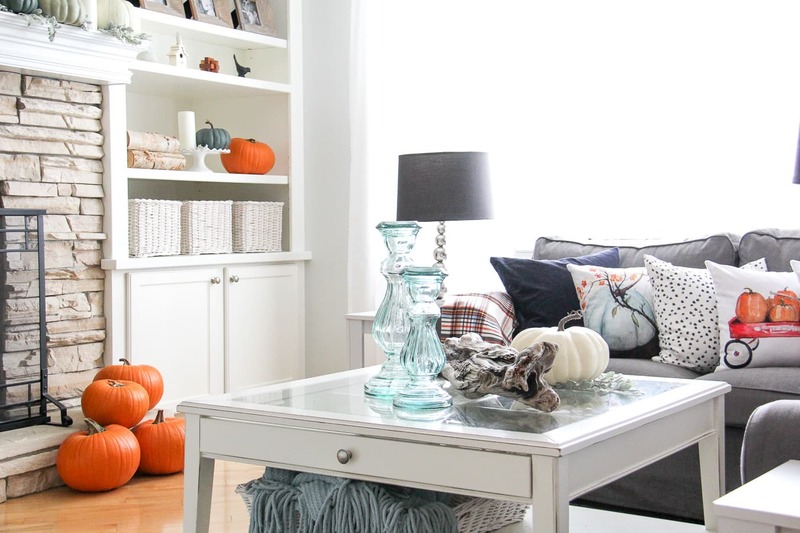 I love this time of year…fall is the perfect reason to make a cozy home…with fall colours, cozy blankets, seasonal pillows, pumpkins and more! So grab your pumpkin spice latte and come take a tour with me! Happy Fall Y’all! 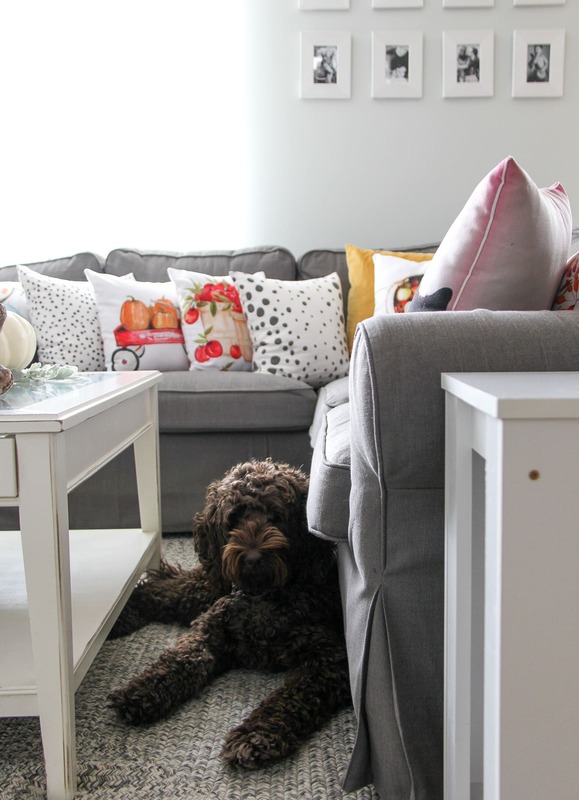 On to my favourite space…my living room. Next to the kitchen, the living room is the hub of our home. It’s the first space you see when you enter my home, so I thought it was a good place to start. When I decorate in here I really try to keep things practical. I like practical and pretty. We use this space everyday, so it has to be functional. The easiest way for me to do this is to change out simple elements with each season. 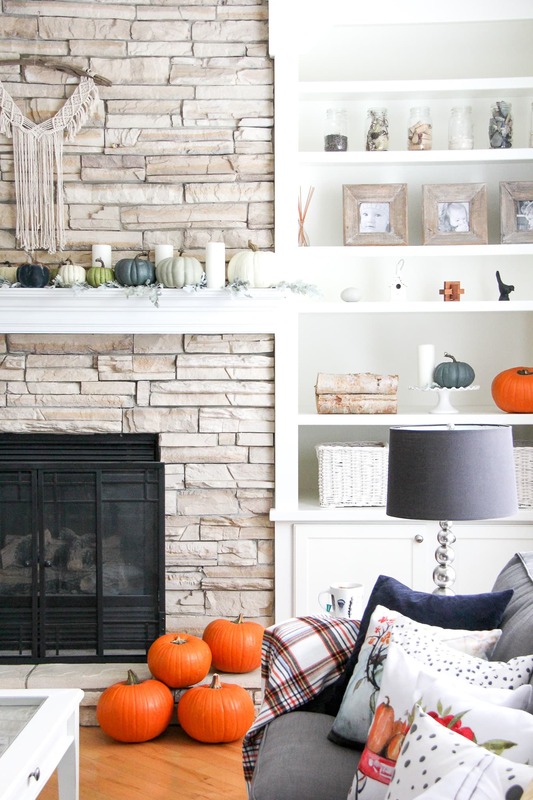 I added some pumpkins to my Neutral Fall Mantel (which I shared here last week), and they tie in perfectly with all of my colourful seasonal pillows and blankets. I really love blues, greys and orange paired together, and it’s a good thing since so many of my every day accent pieces are blue and grey. I think these colours work really well together. 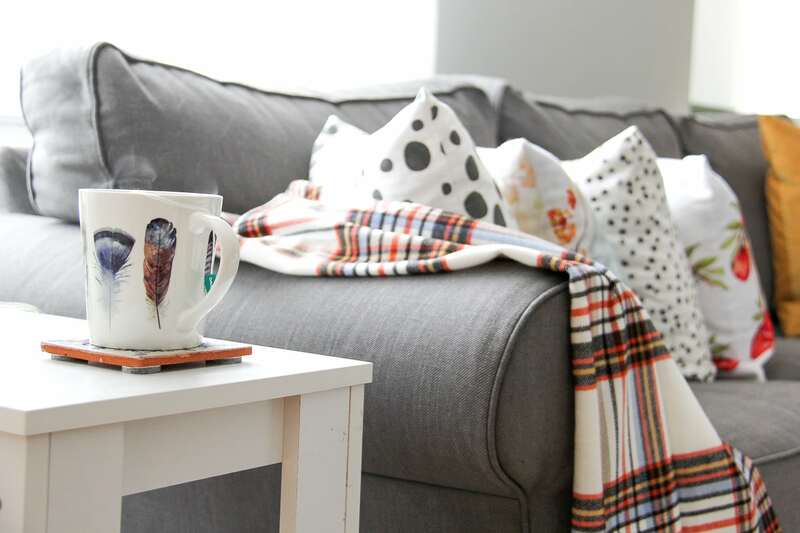 Let’s sit and have tea…just push aside one of the dozen pillows I have on my couch and make room. One can’t have too many pillows can they? No. 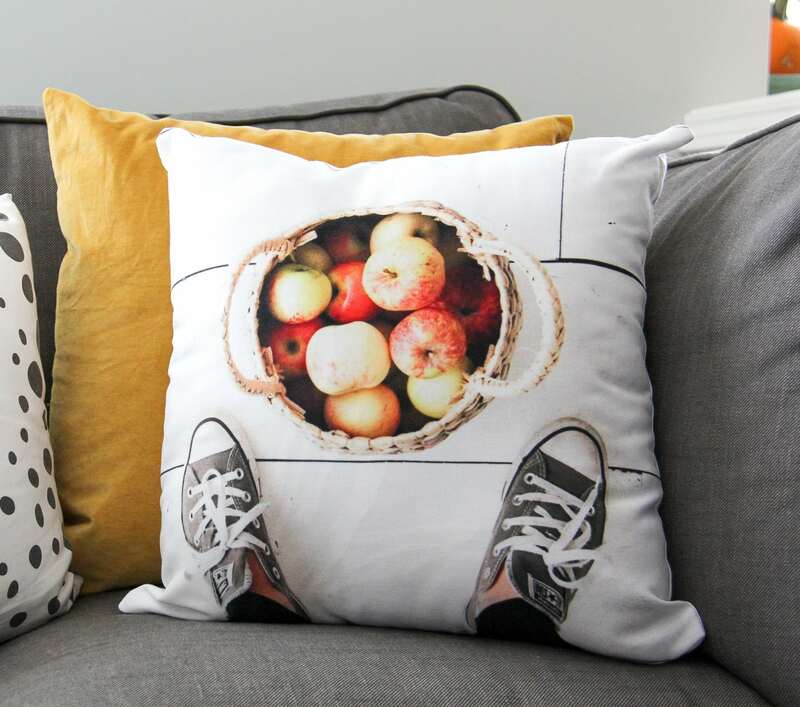 One of my most favourite finds this fall is this pillow I made with CanvasPop! This is actually a photo that I took and shared on Instagram last year! You can take any photo and have it put onto a pillow…how fun is that?! All I had to do was upload my photo and in a few days I had a pillow. Just think of the pillow possibilities! I think it’s really neat to have pieces of your own art in your home. Love love love. I should also mention that they are durable too…I had to wash one of the covers after my dog put her dirty paws all over it…I threw it in the washer and it came out good as new. Now on to my kitchen and eating nook. With the open floor plan on my main level, I like to try to decorate the whole space so it all flows together. It just feels nice. 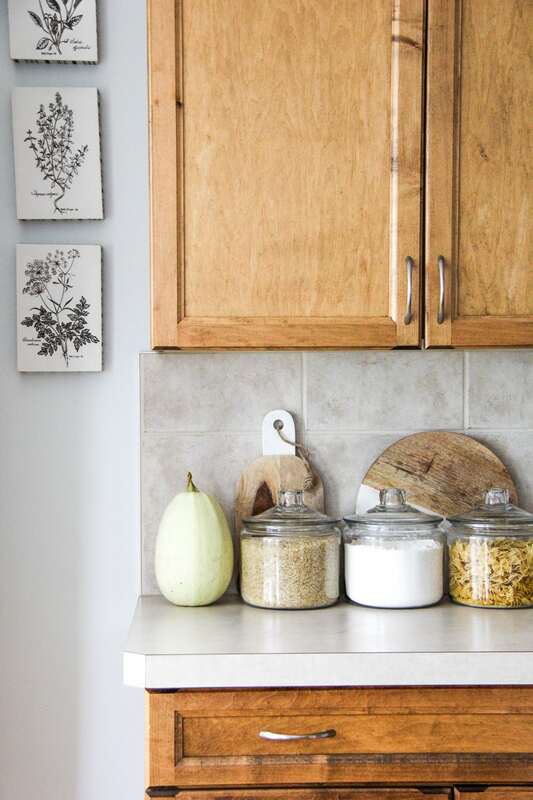 I always love to decorate with natural elements as much as I can…especially in a working kitchen. Swiss chard is doing double duty as a bouquet, while it waits to be turned into dinner! Fruit bowls are loaded up with fruit ready to be eaten. Functional and gorgeous. 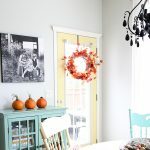 I made a new fall berry wreath for my front door this year, but didn’t want my fiery leaf wreath from last year to sit in the storage room, so I decided to hang it inside on our patio door. I love it here. It adds the perfect pop of colour. Doesn’t it look so nice with the aqua and yellow? Here’s my kitchen…I don’t change too much in here. I like to add seasonal tea towels and put squash out on display…that spaghetti squash is also going to be dinner next week. I still use these glass containers for all my most used ingredients. They look pretty all filled up, and they’re convenient…there’s me being practical again. I also started collecting wooden cutting boards and I used to store them in a cupboard, but I thought it was a shame not to have them out where I could appreciate them. So I decided to layer my favourites behind these jars and I love how it looks. 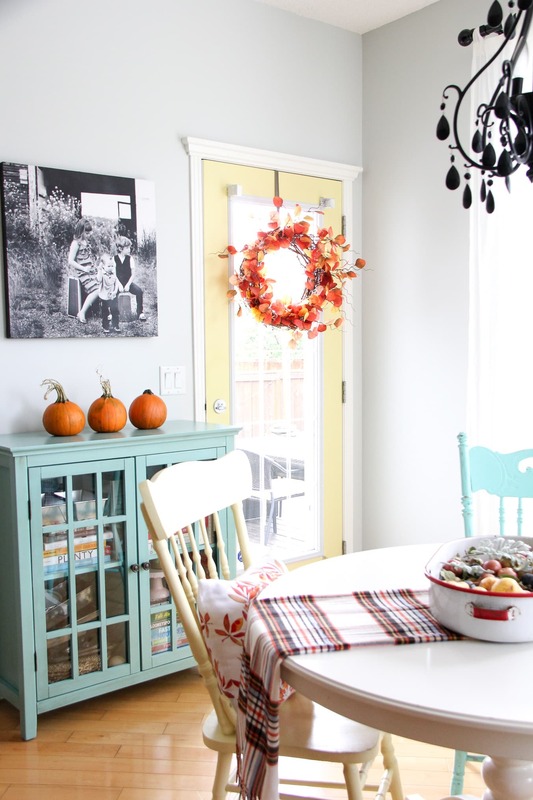 And what’s a fall kitchen home tour without something to eat?! 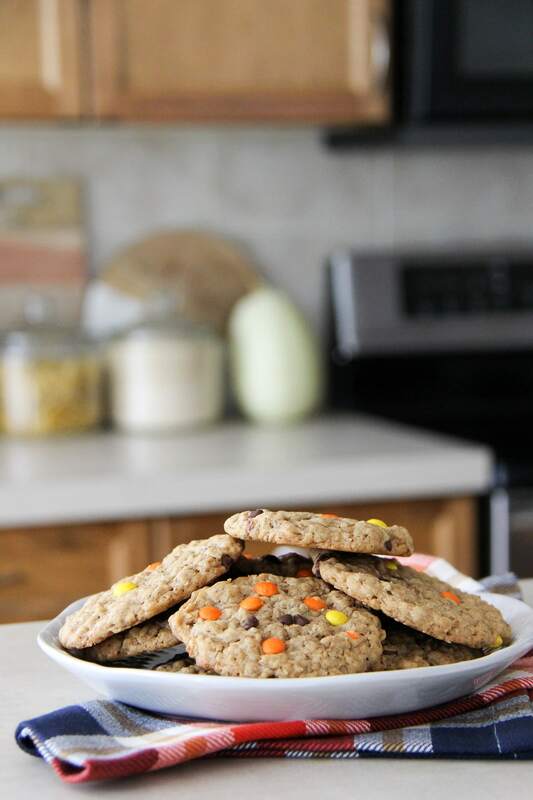 Have a Monster Cookie…they’re delicious. So that wraps up my fall home tour, I hope you enjoyed it! When I share my home with you, it is in hopes that you may find inspiration to create a cozy home for you and your family. 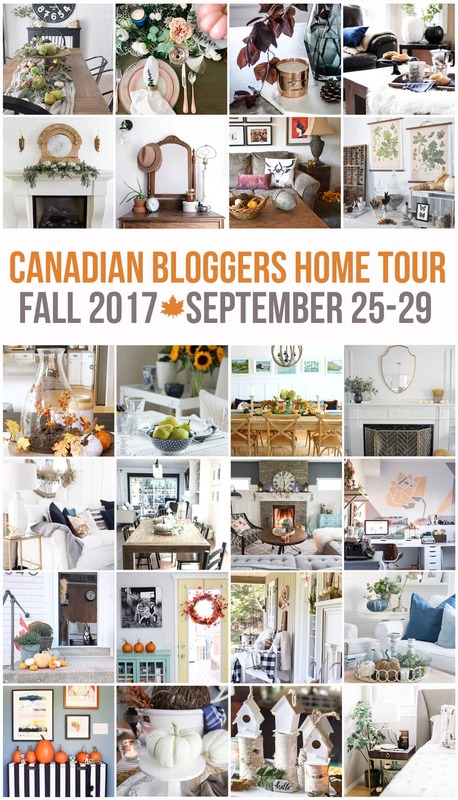 If you are looking for more ideas for your own home, I hope you can take some time to check out these beautiful fall home tours that are part of this Canadian Bloggers Home Tour! 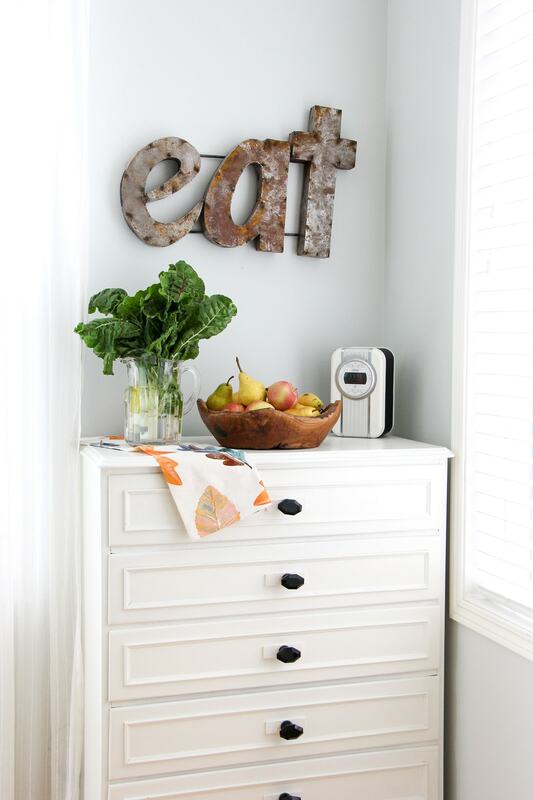 It’s so fun to see how everyone decorates their home…there are so many styles, you’re sure to find something you love! Another great way is to follow the hashtag #CBHomeTour on Instagram! If you’re wondering where you can find some of the pieces in my home tour, here are the sources. Some are affiliate links that help me make a small commission. Thank you for supporting my blog! Oh my, I love your bright and cheery home so much! The detail and function make me so happy! I did not notice how your hardwood runs angled before, I LOVE that little detail. Your apple pillow is AHHHHHHHmazing! I’ll have to check that site out. 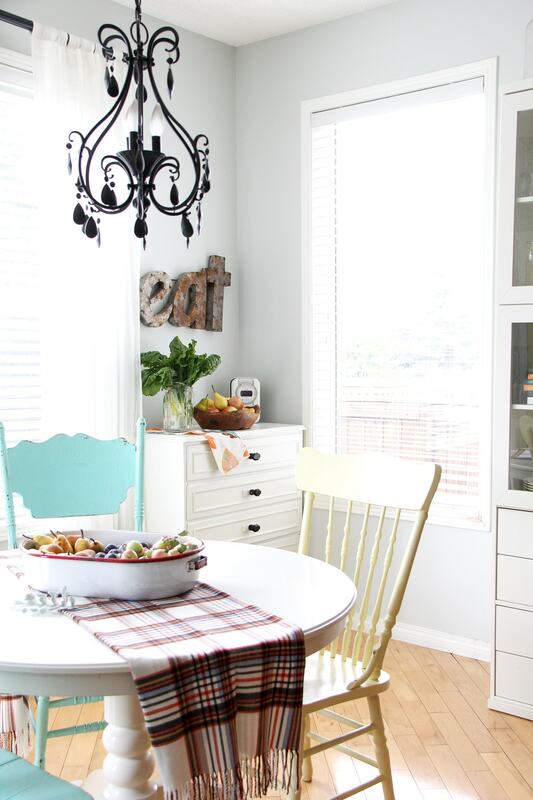 The kitchen nook is my fave, I adore that yellow door and the mismatched chairs, that glassed hutch all of it, what a gorgeous spot to have tea and watch you create your magic in the kitchen! 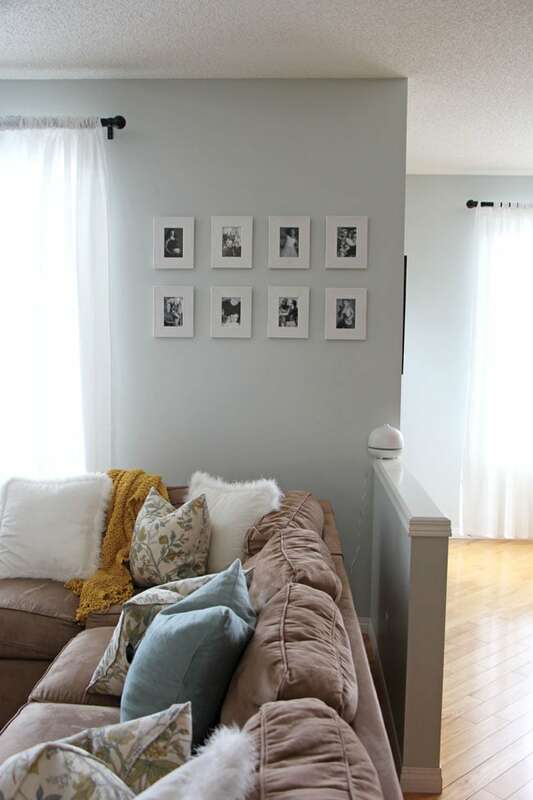 Also, that black and white print of your littles – that makes it this space absolutely perfect! YOUR HOME. I just love love love your fireplace. And your pillows. AND YOU MADE THAT PILLOW. i need to do that. JO DASH. Your home is stunning. 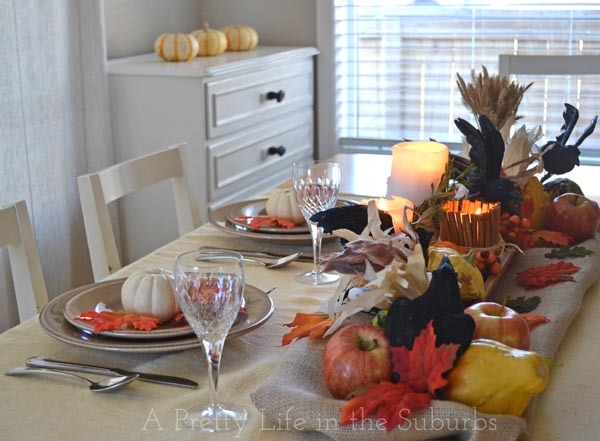 So many beautiful fall touches! 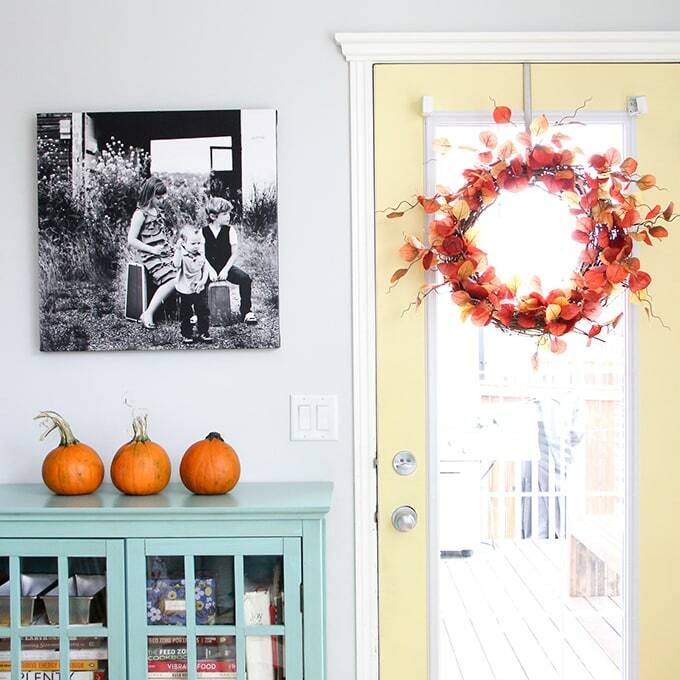 I love the wreath on your kitchen door; and the pops of orange throughout are stunning, Jo-Anna! I would definitely love to come over for a chat and one of those cookies!! Wowza! One can NEVER have too many pillows! Or at least, that’s what I tell my husband almost daily 😉 Your home is so cheerful, just like you- I love all the details. 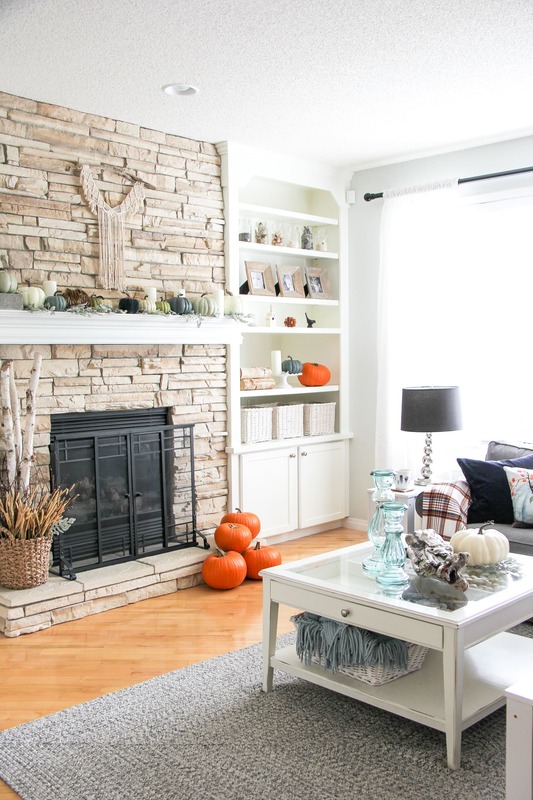 That macrame over the mantle is stunning as well! Your home looks beautiful and so cozy. 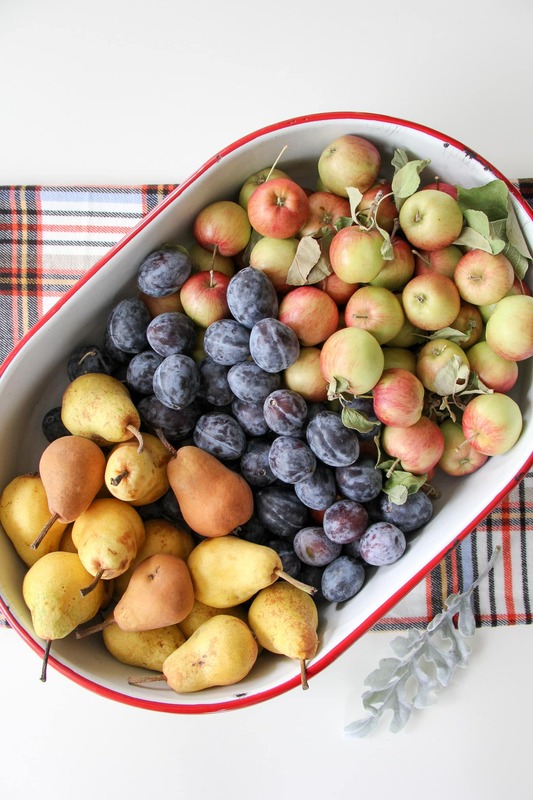 I just love your vintage enamelware on the table with the fruit -what a perfect centrepiece, beautiful and delicious. 😉 Great job. I always love how you give your porch as much attention as your indoor spaces. It looks so pretty and inviting. The blues, greys and oranges in your living room are lovely together and your mantel looks so pretty! I adore the pillow you made with CanvasPop too. I totally want to do that now! And my dogs are constantly dirtying the pillows, so I’m happy to hear you can machine wash these cushions. Great idea turning swiss chard into a bouquet too, and you can’t beat that big dish of fruit. Love it all! Love that canvas pop pillow you made! So clever! Your home is always so lovely and cheery! Thanks so much for the tour! 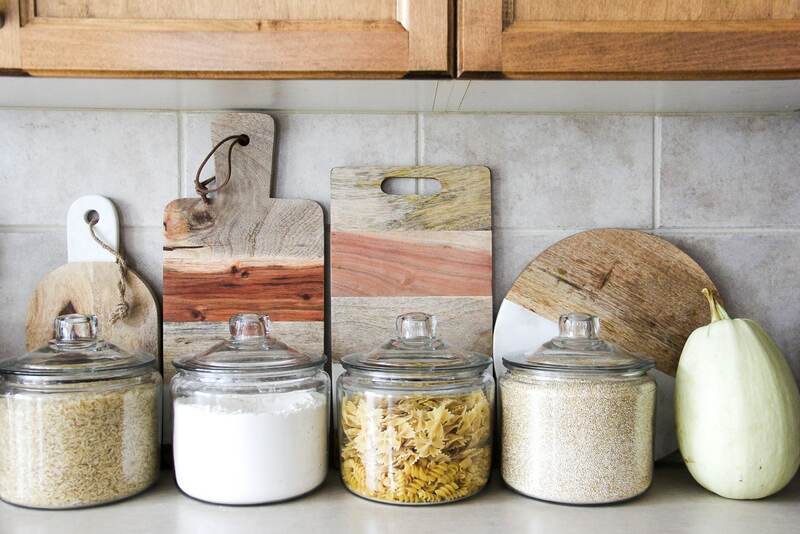 Those cutting boards definitely need a spot in the sun. Beautiful! 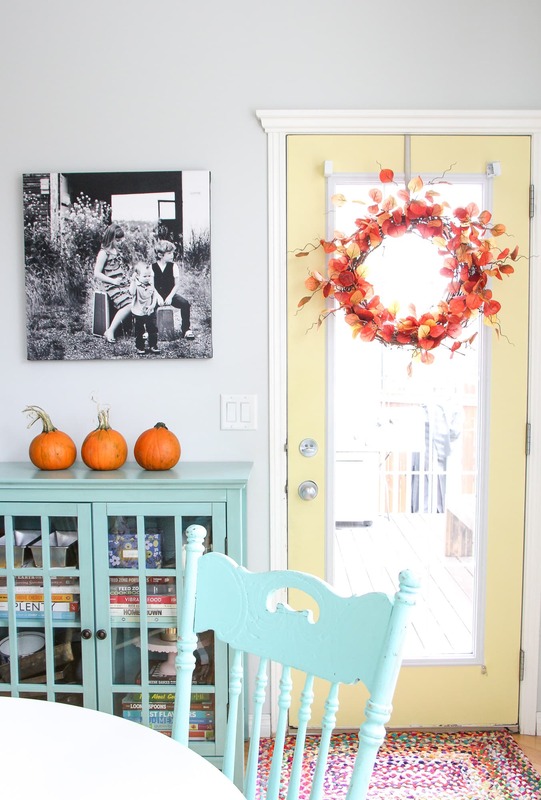 And I love the yellow door, wreath and aqua cupboard together. Great job with everything. You had me at “bright and cheery”! 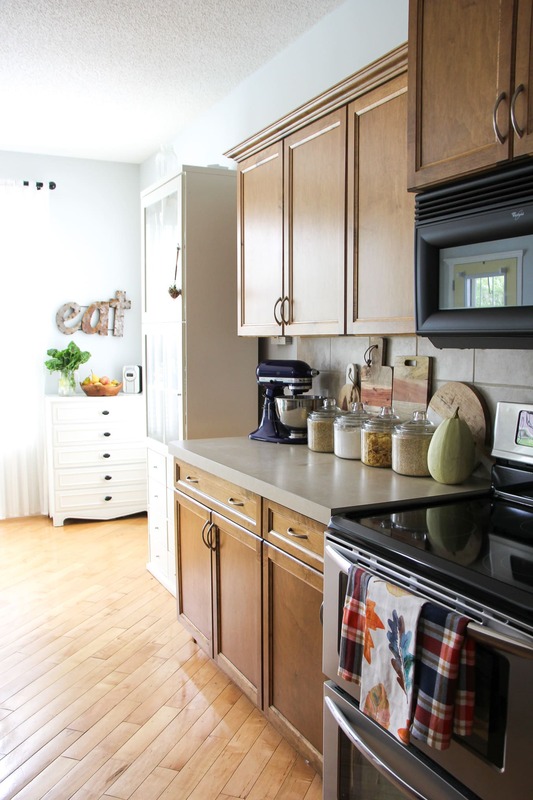 Always such a great livable home decor style, and your choice of natural accents is perfect. Well done friend! I love all the colour you have, Jo-Anna! 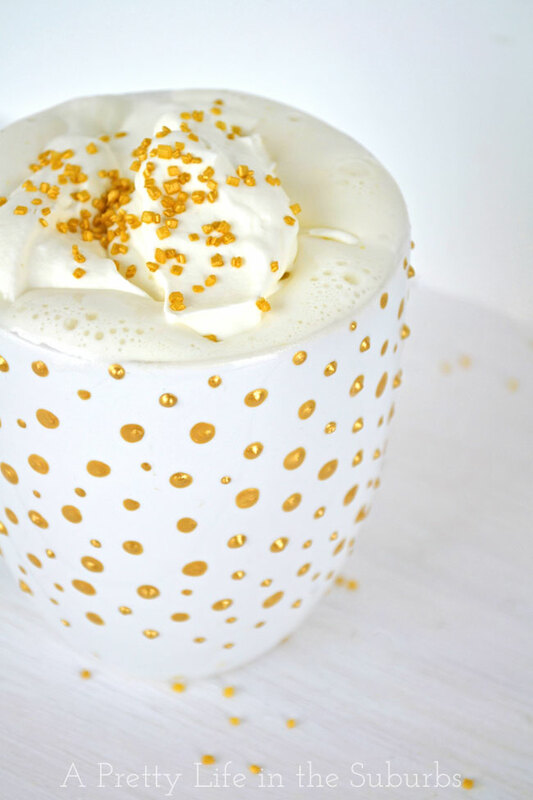 It’s so cheerful and cozy and perfect. Cute custom pillow, too!